Tool to decrypt/encrypt as a Knight Templar. Knights Templars Ciphers is a substitution code replacing letters by symbols from the Maltese Cross, icon of Order of the Temple. Team dCode likes feedback and relevant comments; to get an answer give an email (not published). It is thanks to you that dCode has the best Templars Cipher tool. Thank you. > [News]: Discover the next version of dCode Templars Cipher! How to encrypt using Knights Templar cipher? Encryption uses 25 symbols to represent the letters of the alphabet (The letter J is missing and replaced by a I). The symbols used by the templar alphabet are pieces of the Maltese Cross. How to decrypt using Knights Templar cipher? 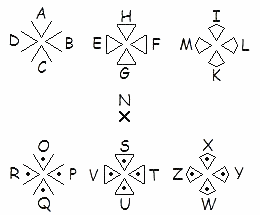 Templar decryption requires converting each symbol to their corresponding letter. How to recognize Templars ciphertext? The ciphered message is made from symbols with angles, triangles, with at most one dot per symbol. The message has at most 25 distinct characters. Any reference to the Knights Templars or Solomon's Militia (with a reputation of killers/assassins) is a clue. What are the variants of the Templars cipher? Why is the J letter missing? The letter J did not exist when encryption was invented, it was a graphic variant of the letter I, and the J only appeared around the 16th century. When Templars Cipher have been invented? Improve the Templars Cipher page!